This time when Mytria and I entered our “Holoschool,” we saw the Arcturian again in front of the "Transmissions to Earth Screen," which appears more like a membrane. The Screen revealed a group of Earthlings who we instantly recognized by their energy fields as Pleiadian and Arcturian in nature. However, they were all wearing their human earth vessels. We could see their third dimensional bodies sitting in a circle, as well as their higher fourth dimensional bodies with whom the Arcturian would be communicating. It appeared that the Arcturian had already introduced Itself, and one of the fourth dimensional bodies was standing and about to ask a question. Mytria and I quietly stood behind the Arcturian knowing full well that It was teaching through example how to answer some of the many questions that we would be asked. Thus, we said nothing and observed as the question and answer session began. The standing ascending one was actually the Earth expression of one of our friends with whom we had laughed just last night. Or, perhaps that was a lifetime ago? We felt such joy that our friend’s grounded expression was able to communicate directly with an Arcturian. 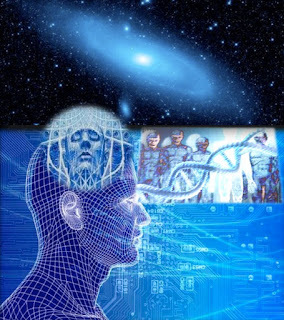 “Dear Arcturians,” asked our friend in a human disguise, “We have some questions to ask you. However, first we want to thank you for all the assistance you have given us. We do not know how we would have tolerated third dimensional reality without your guidance. “Dear Ascending ONE,” spoke the Arcturian,” We want you all to know that we, your Galactic Family, are YOU. Hence, there is no question of whether or not we would be of assistance. When you merged your great Essence with this expression of your Self, we promised that we would help you. We assured you that we would call you as soon as your consciousness was expanded enough for you to hear us. Your answer to our call set your life into a completely different direction. In actuality, your answer to us, your Higher Expression, set you into a new Path of Realty. There are many Paths of Realty, and the smoothest Path is the one forged by your Higher Expressions of SELF. In this manner, you, the grounded ascending ones, can always have access to the Higher Perspective of your journey. Within this Higher Perspective is a direct line of communication between the YOU who has volunteered to enter Earth during this Timeline of Planetary Ascension and the you who is a Higher Expression of your SELF. With meditation and practice, the link between you and your Higher Expressions of SELF will become a constant source of support and guidance. Dear Ascending Ones, would you like to ask your first question? Another person stood, who was an old friend from our Homeworld. We so wanted to say hello to her, but her human expression could only see a very, vague image of the Arcturian. The Arcturian warmly replied, “We are equally pleased to speak directly with one of our ascending family members. We understand the difficulty of limiting your immense Being into a small earth vessel. Your fatigue is largely because your consciousness operates at a much faster rate than your physical earth vessel. “Often your earth vessel appears to be completely still while your consciousness is processing realities that are invisible to the senses of your 3D Vessel. This condition is much like keeping your car in neutral while you press down the accelerator. The car is ready to go, but you are not in a gear for movement. “Your earth vessel is much like an automobile. This auto has a 3D body and operating system that is in the process of adding a new computer program. However, your 3D vessel is unable to read this new Operating System. Largely computers run the newer cars, but you cannot ‘trade in’ your current vehicle. “Hence, you must find a way to convert your old car into a format in which it can respond to the directions of your new computer system. This transition of operating systems causes great fatigue for your 3D earth vessel. The fact is that there are inherent limitations in your physical form that will never be able to read all the information that is now available to your consciousness. “Therefore, your brain is working overtime attempting to make sense of information that is entering your consciousness via your the new Operating System. However, due to the inherent flaws of your earth vessel, this system cannot be totally connected to the body you are wearing. For this reason, it is best to allow your grounded self to relax into the guidance of your Higher Expression of SELF. Then your Higher Expression can ‘tow’ your earth vessel. All you need to do is to put your vessel/car in neutral and make sure the brake is off. “Fear is your braking system. If you try to surrender into the guidance of your SELF, but your ego puts the brakes on with its fear, the resistance will create great fatigue. However, we are NOT saying that all your fatigue is due to this dynamic. There are many of our ascending ones who have gained great mastery of their fear, but their earth vessel is simply not equipped to move as fast as their minds. “Therefore, fatigue arises from the constant resistance of your body that cannot accept the acceleration of your consciousness. Fortunately, your bodies are also going through a transmutations process, but the physicality of the body creates a much slower transition than the flexibility of the consciousness. “This situation is more difficult for the ascending ones wearing an older model of earth vessel. Fortunately, the extended years on Earth have awakened enough wisdom that these ascending ones do not judge their body and allow it adequate rest. The ascending ones who entered their earth vessels decades ago have also had the challenge of many, many years in which they had to keep their true SELF a secret. “Consequently, the constant constraint of ones true expression often causes physical conditions that forces the older version of earth vessel to move more slowly. Fortunately, patience is often gained through decades of experience. Furthermore, the guidance of their Higher Expression has often led them into a reality in which their responsibilities to the 3D illusion are greatly diminished. Hence, they can take on their well-earned status of Mentors. “On the other hand, our Galactic Family is entering more young earth vessels. These infants, children and teens have instincts that allow them to access many of their innate, multidimensional abilities and information. These young ascending ones are too often born to parents who cannot understand or assist them. However, as your society continues to awaken there will be more support for these ascending members of ascending Earth. These ‘children’ will be the leaders of your new reality. “Yes,” answered the Arcturian, “Dizziness is another symptom of transmutation, but it is because of a slightly different reason. The dizziness you are experiencing is because you are beginning to consciously experience more than one reality at a time. In fact, ‘time’ has shifted from an element of stability and structure in your life into yet another changing dynamic, to cause even further confusion. You are confused about the erratic nature of time and about the myriad thought, sensations, pictures and/or memories that waft in and out of your mind. “Those of you who have created a solid link between your current earth vessel and a Guide or higher frequencies Expression of your Multidimensional SELF often have less confusion, but more dizziness. In this case, the dizziness comes from that fact that you are currently running two diametrically opposed operating systems. Your Third Dimensional Operating System is telling you that you are limited to your clay shell, that there is only one reality. “In fact, your Third Dimensional System tells you that you are "hallucinating" if you are experiencing a different reality. This old System tells you to ignore those stimuli, as it is NOT real. Only that which you perceive with your five physical senses is real, and everything else is just your imagination. At the same time, your Multidimensional Operating System is telling you that everything that you perceive with your five physical senses is an illusion and only your imagination is REAL. “Meanwhile, the circuitry of your physical brain is overloaded with conflicting information and too much stimuli to effectively compute. Your brain is like a computer in which you have opened too many windows and now the entire system is freezing up. Whereas your computer would likely stop functioning, your brain makes you feel dizzy. “Is the outside world real, or the inside world real? Is that memory or passing vision from the corner of your eye real, or the clear vision in front of you real? What is real? To what can you attach your anchor and your sense of SELF? These questions confuse your 3D brain even further. Your overloaded brain desperately tries to separate and sequentially file multidimensional sensations that are neither separate nor sequential. “Hence, your mind begins to spin and you feel dizzy. The solution to this issue is to fully download and integrate your Multidimensional Operating System. However, in order to do so you will have to ‘upgrade’ your biological computer by bringing the 97% Ascension DNA fully online. Many of you have already completed this upgrade. “However, once the Ascension DNA is fully operational you have an even greater challenge, which is connecting this 97% Ascension DNA with your 3% earth vessel DNA. This process is the cause of the greatest dizziness because you have to connect two totally opposite systems of operation. “Then, just as a car may sputter and stop, your biological brain spins and shuts down. To deal with this dynamic, your body becomes "sick" to create a good reason for your dizziness. Then you go to bed and go to sleep, which is a very good solution. While you are adding a new operation system to your computer, you cannot open any programs or do anything with the computer. You have to wait until the new system is totally downloaded. Then, when you restart your computer it appears to be much the same. However, there are subtle differences that you do not recognize until you use your computer. Your brain is a biological computer and runs in a very similar fashion. “Many of you are trying to download a new Quantum Operating System into an old computer. For this download, you will definitely need the assistance of your Higher Expressions of SELF. Your Higher Expressions are your Guidebook. They will assist you to understand your new version of SELF, just as we will. Mytria and I wondered if the small group would catch the glint in the Arcturians aura that had become so familiar to us as It said, “You are very correct. Your consciousness and more of your reality than you realize is already fifth dimensional. However, you cannot compute much of the higher stimuli that fills your new world because your 3D brain cannot yet recognize this data. Your 3D brain is simply refusing to accept these perceptions as real. Hence, they never travel through the reticular system of your brain. “The neural network of your reticular system acts as a ‘firewall’ that screens out data that your ego self deems is unimportant. On the other hand, once your Multidimensional Operating System is fully online your Multidimensional SELF will determine what information is important. Then you will be able to consciously perceive, integrate and understand how much your reality really has changed. “If you can believe in your SELF, as well as any stimuli which activates the feeling of unconditional love and/or joy, you will gradually calibrate your primary perception to the higher frequencies of reality. However, remember that your physical sensations of hearing, vision, touch, smell and taste will not be adequate to fully register higher dimensional sensations. You will have to trust what you THINK you hear, see, touch, smell and taste. “You are accustomed to sensations and information coming from the outside of you, such as through your eyes or ears. When you perceive the higher frequencies of reality, you will perceive them from within your core. To best understand this multidimensional information we suggest that you run these perceptions through your High Heart and Third Eye. Your High Heart and Third Eye are your Heart-Mind, which is your primary sensory receptor and processor of multidimensional input. “Also, remember that you will not experience the fifth dimension in the same manner that you interact with your physical world or even your fourth dimensional dream world. Your sense of touch will be attuned to experience auras, as will your vision, hearing and even your smell will respond to the more ethereal messages. You will not experience hard edges, spaces of separation or any fear-based emotions. “We have given you enough information for now. However, please remember that your new realities will appear different. If you had always lived near the ocean all of your life and moved to the desert, you would have many new sensations to compute. Therefore, can you imagine how many more new sensations you will experience when you resonate to a new reality of a different dimension? “Fortunately, more and more of you will be sharing this journey, so please remember to create groups in which you feel safe enough to share and discuss your new experiences of reality. Most of all, please remember that you are NOT alone for we, your higher expressions of SELF, are always with you. “We close this communication, but please know that you can personally continue it within your higher states of consciousness. I am drawn to these transmissions; they are my favorites! I play words with friends and I keep creating Mytre and Mytria. Thank you so much for sharing these! I am learning so much!